The Daily Struggles of the Domestic Un-Goddess: Dark Chocolate, roasted hazelnuts...and tofu? After my escapades on Friday night, I was extremely apprehensive about what I'd gotten myself into. Not only did I have to visit three stores to find the particular chocolate I was looking for, but as my other post said, I dropped my silken tofu on a pile of dirty dishes, my first taste test was literally nauseating....and so I was nervous. I've always been a lover of dark, delectable chocolate. Having been described from the tender age of four as a shameless "chocoholic," my passion/addiction to chocolate really blossomed the year I lived in France. There were so many types of dark chocolate available, at nearly every percentage point of chocolatude....it was a dark chocolate lover's dream. 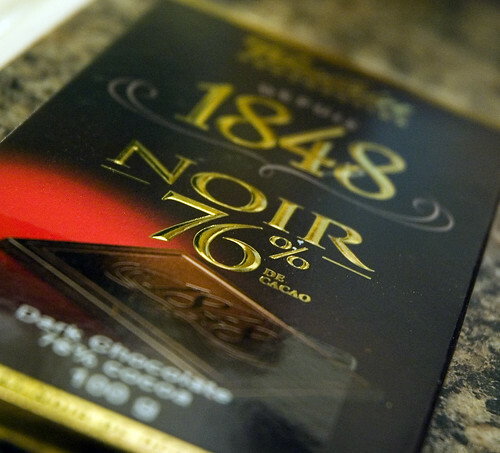 There was nothing I loved more than to nibble a square of Poulain 76% dark chocolate after dinner. Even though I lived in a spartan 18m2 studio apartment, I could brew myself a strong dark Italian coffee with my stovetop italian coffee maker and imagine myself in a magical world of endless decadence. Alternative nibbles of my Poulain 76% chocolate and sips of strong, nearly bitter, brew. Heaven. Thirteen dollars poorer (I bought 300g), I floated the rest of the way home. It took some trial, peppered with much error, to come up with my final recipe. But it turned out better than I could have imagined, and as with the other vegan dinner party recipes, it is suitable for non-vegans. Provided no one has any soybean allergies, you could get away with serving this to anyone. *To toast hazelnuts, preheat oven to 350F, toss hazelnuts on a baking sheet. Shake them every few minutes, until they are fragrant and the skins are coming loose (about 10 minutes). Let them cool for a few minutes and you should (in theory) be able to rub the skins right off. 1. Preheat the oven to 350F. In a food processor/blender, add the flour and the whole toasted hazelnuts. Process until the hazelnuts are coarsely ground. Add in brown sugar and margarine, and process until combined. 2. In a 9-inch springform pan, pat the mixture down to form a crust (it seems like there isn't enough, but with persistence it eventually spreads out). 3. Bake for 15 minutes. Cool. 1. Chop chocolate (or be lazy like me and take out your tofu-inspired rage on poor unsuspecting bars of chocolate...I just whacked them with the heel of my hand while they were still in the box). 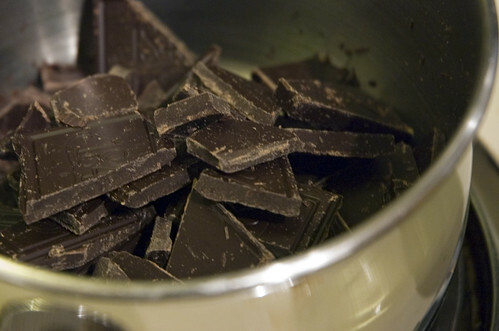 To melt chocolate, use a burner on the lowest heat setting and stir regularly until chocolate is completely melted. Do NOT get any water in the pot, and resist the temptation to turn up the temperature. Burned chocolate is not happy chocolate. 2. Meanwhile, blend silken tofu in a food processor or blender. While the chocolate is melting, measure out the remaining ingredients (chocolate cools/hardens quickly, so this will make your torte better looking than mine, as you won't be randomly thinking "what the heck do I add to this to make it edible????"). 3. Add in melted chocolate, as well as the sugar, cocoa, vanilla, cinnamon and cayenne pepper. Blend away until well-combined. Stir in hazelnuts. 4. 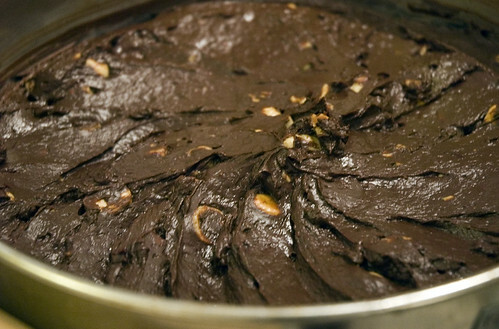 Pour the chocolate mixture over the hazelnut crust. Spread to desired smoothness. My chocolate was cooling a bit by this point, but if you are speedier than I, you can likely get a smoother result. 5. You can make ahead to this point. Store in the fridge, but ensure that it is served at room temperature. Sprinkle the top with white sugar (about 1/4 c.). With a propane torch, carefully melt the sugar (trying not to burn the chocolate). Allow to set in fridge for about five minutes. It was rich, but not too sweet. And the lovely part was, the richness of the chocolate filling was achieved without 35% cream or butter - I really didn't think this would be as good as it was. I think it would be amazing presentation to serve this with starburst mango and raspberry coulis (Put a circle of raspberry coulis in the middle, surround with mango, and use a toothpick to make a starburst. Set cake on top. I ran out of time to tend to such ministrations, but it really would be lovely). eeek! $13 for three bars of chocolate? Sounds like you're in need of a chocolate care package! Your torte sounds delicious, and I have been enjoying vegan week and I think your veggie lentil rolls will be making an appearance around here sometime soon. Congratulations on a successful vegan week. The 2 lbs and 2" lost are a nice bonus!! 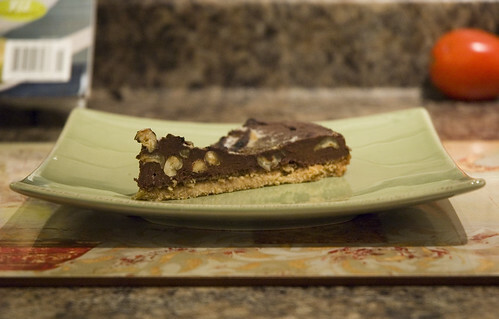 Your tart looks tasty what with all that lovely chocolate plus the hazelnut crust. I love this event, I get to learn of other chocolate brands that i have never heard of. The brulee top is genius! Looks amazing, I can't wait to try this myself! A bit of an aside, though: white sugar isn't vegan. anonymous - I know that regular white sugar isn't vegan. In all the research I did, I found that there were many different levels of vegans....sugar seems to be something where feelings are a bit mixed, with the more hard-core vegans nixing it, and the less hard-core just minimizing their consuption. It would be easy enough to find raw cane sugar and substitute it in this recipe. I didn't buy any as I'd already spent a small fortune on my vegan week experiment, but for those who wanted to, there are alternatives out there that are considered perfectly vegan. As I've said - it's complicated!!!! !